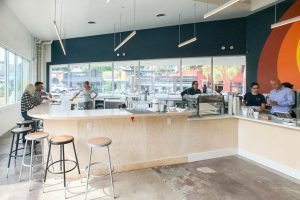 Silver Lake’s got a new all-day player to enjoy, and its name is Mixed Company. The colorful Sunset Boulevard addition has been nearly two years in the making, but softly opened its doors for service this morning. Step inside the bright, airy space and you’ll find a wonderfully colorful interior complete with open kitchen (complete with wood-fired grill) and a coffee bar for those looking to linger over a cup. The space is big too, landing in the 120-seat range, and offering a wide variety of dining options throughout the day. As has become the norm it seems, the menu skews Middle Eastern, including lamb kabobs for lunch, but mostly this is casual California cuisine at its produce-driven finest. Breakfast starts daily at 7 a.m., lunch kicks off at 11:30 a.m., and the whole package rolls from there into dinner (10 p.m. early in the week, 11 p.m. later in the week). The prices on our menu are the prices you pay; they’re inclusive of all services rendered and jobs performed. You need not offer more as a gratuity; in fact, we aren’t “equipped” to process them. The statement goes on to call tipping part of a “false economy,” while reiterating that left-behind cash will be donated to a local non-profit. Mixed Company softly opened for service this morning, and keeps daily hours from 7 a.m. to 10 p.m. or later. The project is part of the larger Black Cat team of restaurants, which also includes the casual Village Idiot over on Melrose.